This beautiful savory tart was adapted from a Martha Stewart recipe. I made this for a Fourth of July BBQ and have been meaning to write up the recipe for awhile now. This is not really a particularly complicated tart to make. It really looks much more labor intensive than it is. 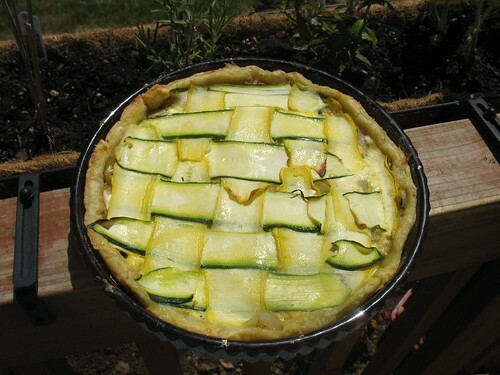 The squash and zucchini for this particular tart were courtesy of Heather Q's garden. Start by laying out your pastry crust on a tart pan and pressing up the sides. If you don't have a tart pan, you can also use a pie pan and only fill to about half way if you're using a pie pan. Poke a few holes in the bottom to help it ventilate and stay flat in the pan. Prebake the crust in a 375 degree oven for 7-10 minutes. Remove the crust from the oven and allow it to cool a bit. Meanwhile, use a vegetable peeler to collect a few long thin strips of the zucchini and the squash...you want enough of each to be able to lay flat across the top of the tart pan. Once you have your strips, pat them off between two paper towels and put aside. Chop the remaining squash and zucchini as well as the onion. Sauté the chopped veggies (not the strips) in oil and salt and pepper to taste for about 5-7 minutes until softened. Take the vegetables off the heat and mix the goat cheese and feta in until everything is well blended. Transfer this mixture to the crust. Whisk the egg into the cream and pour over the vegetable mixture. Now, you can either make an open face tart and just throw it in the oven now if you don't want to fuss with the lattice top, but I think the beauty of the lattice top makes it completely worth the effort! To make the lattice, you will do it just like you would a pie (see this link for instructions) and squash has your horizontal stripes and the zucchini as your vertical stripes. Once you weave them, you will get this lovely effect. I obviously didn't have perfect shape and length on all the strips, but it's easy to overlap strips and just make it work. Brush the top with olive oil. Loosely cover with aluminum foil and bake for 30-40 minutes. Allow to cool slightly before serving. Perfect recipe for a high protein liquid diet, I might try some low fat cheese with this recipe.